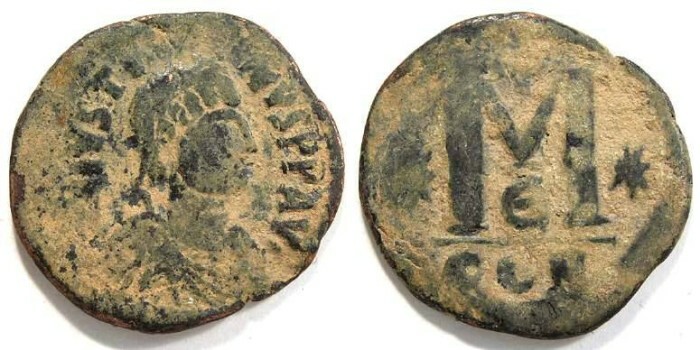 Denomination : Bronze follis. Mint : Constantinople, 5th officina. Size : 31.6 x 33.8 mm. Weight : 13.92 grams. Grade : gF/aF earth patination. Obverse : Head of Justin I right, with D N IVSTINVS P F AV around. Reverse : Large M flanked by two stars, with a cross above, the mint mark CON below, and the offiina mark E between the legs of the M (Constantinople 5rd officina).